Travelling up Wolli Creek from its junction with the Cooks River to Turrella Reserve then up to Bexley North, you pass through several distinctive landscapes and plant communities. The lower reaches of Wolli Creek are tidal and brackish. 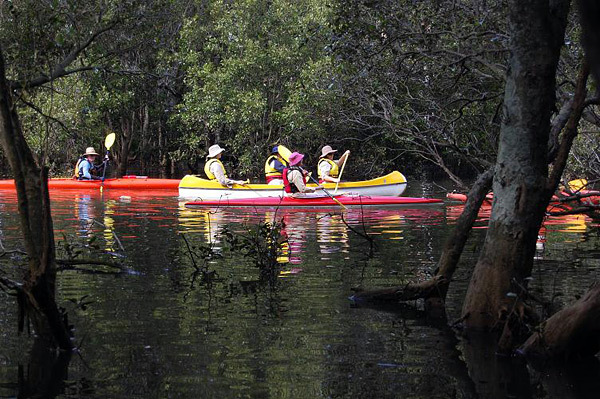 Large mangroves line the banks of the creek, and areas of saltmarsh lie behind, on heavy, silty soil. This area was probably a rich source of shellfish for the aboriginal people. The Grey Mangrove tree has characteristic aerating, vertical roots which emerge from the mud. 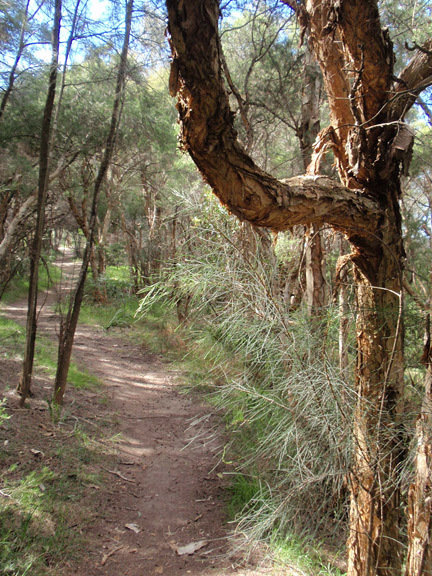 The trees of the floodplain at Turrella Reserve grow in more fertile soil than those on the sandstone slopes above and can cope with periodic flooding from the creek. Swamp Oaks (Casuarina glauca), Swamp Mahogany (Eucalyptus robusta) and Paperbarks (various Melaleucas) can be seen lower down. In the mid 1800s, Wolli Creek was thought to have been known as Cabbage Tree Creek, because the Cabbage-tree Palms (Livistona australis) were so common. No palms have survived from that time, but are re-establishing now. The rugged Hawkesbury sandstone on the steep slopes around Earlwood and Undercliffe weathers to sandy shallow soil It supports open heathland in exposed areas like Nannygoat Hill. 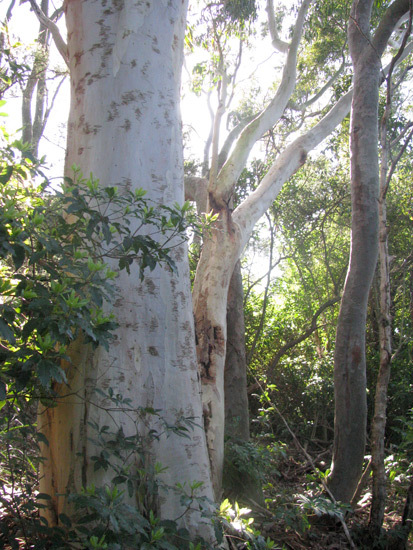 In the more sheltered hillsides you can find the pink-barked Sydney Red Gum (Angophora costata), which contrasts with the Sydney Peppermint (Eucalyptus piperita) and Blackbutt (Eucalyptus pilularis), both of which have rough-barked trunks and smooth upper branches. There is also a a shubby understorey of Banksias (Banksia serrata and Banksia integrifolia), Kunzeas, Wattles, native fuschias (Epacris longiflora) and bracken (Pteridium esculentum). Keep an eye out for Old Man Banksia (Banksia Serrata) with its warty bark. Growing on the deeper clay-influenced soils at the Bexley North end of the Valley, you can see denser forest, and open woodland. Plant communities growing on clay soils have a much less shrubby understory than those that grow on sandstone. Fibrous-barked Turpentine trees (Syncarpia glomulifera) are dotted along the track, along with native vine species, some of which have very thick stems snaking up into the canopies of the trees. 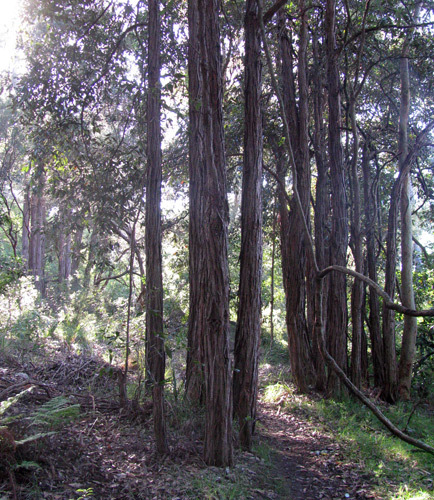 Closer to Wolli Creek there are even rainforest trees such as Coachwood (Ceratopetalum apetalum), LillyPillies (Syzigium sp.) and Water Gums (Tristaniopsis laurina). For some history on the trees in this area and a detailed guide to identifying local trees, have a look at Les Robinson’s excellent document (link below). Although written in 1987, it contains a lot of interesting information and is well worth a read.